“Prayer Fans” Cuff Bracelet. $525. SOLD. Prayer fans send our hopes and dreams, thanks and pleas spiraling skyward to the spirits on tendrils of purifying smoke. Wings evokes their beauty and power in this eighteen-gauge sterling silver cuff, hand-milled in a geometric design of fanned feathers, gently swaying in purposeful motion. The band is simple in the extreme, a perfect slender rectangle beveled at the sides and rounded comfortably at the ends. 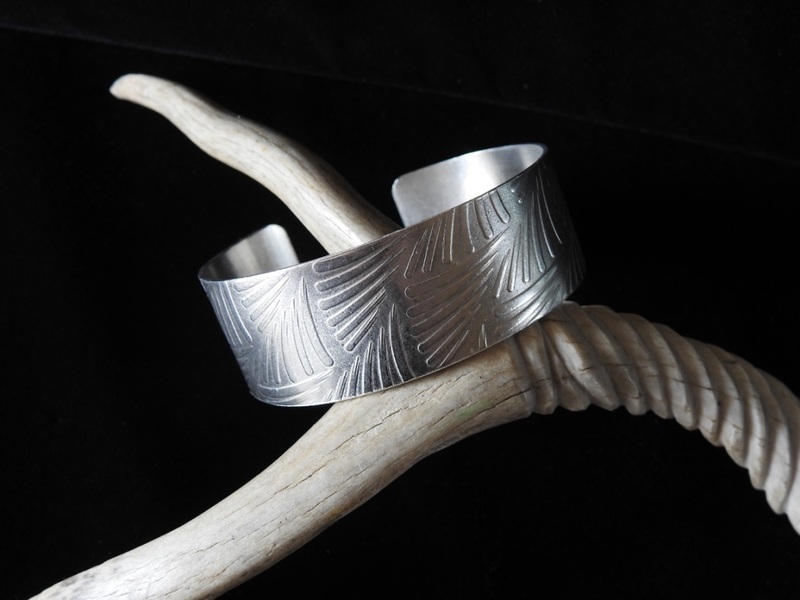 The feathery pattern, gently raised in light relief on the surface, runs the entire length of the cuff. The band is 6.75″ long by 7/8″ across (dimensions approximate). Posted on Monday, October 29th, 2018 at 4:39 pm. Filed under: Bracelets, Cuffs and Links and Bangles	RSS 2.0 feed.